Non-cultured epidermal cellular grafting is an innovative surgical technique that can be used for the treatment of stabilized leucoderma, including vitiligo. Many reports have been published since its introduction in 1992, including several modifications and simplification of the original technique. This systematic review gives an overview of the literature. Since the description of the original procedure in 1992, many reports followed, including several modifications and further simplifications. The purpose of this review is to give an overview of the literature with respect to treatment outcome and developments in the technical procedure of non-cultured cellular grafting in vitiligo. The computerized bibliographical databases Pubmed (U.S. National Library of Medicine; National Institutes of Health) was screened for clinical trials from January 1960 to July 2010. The main keywords used were "vitiligo, grafting, melanocyte grafting, surgery, melanocyte transplantation, non-cultured epidermal grafting." Other data sources were the reference lists from articles retrieved. Only the clinical trials on non-cultured epidermal cellular grafting (using trypsin) for vitiligo (segmental, generalized, mixed) and in addition, other types of leucoderma (halo nevi, nevus depigmentosus, chemical leucoderma, piebaldism) were included. Single case reports were not included. All publications were classified by level of evidence (CBO/EBRO guidelines, Utrecht, The Netherlands). In total, 21 studies were obtained using the database [Table 1]. Most of them (16) were publications of level of evidence C, 3 of evidence level B, 2 of evidence level A2, and none of evidence level A1. In the original description of the procedure, a donor sample was obtained from the scalp by superficial shaving using a dermatome with a razor blade and then treated with trypsin 0.25% for 18 h for dermo-epidermal separation. Subsequently, epidermal cells were extracted and a cellular suspension was prepared. This suspension was inoculated into blisters raised with liquid nitrogen at the recipient area. The roof of an intact blister served as a natural dressing that held the transplanted cells in place. Advances in the procedure were also made in the preparation of the recipient area. De-epithelization of the graft recipient area bed can be achieved by cryotherapy, induction of suction blisters or dermabrasion using a high-speed dermabrader. However, for more delicate or critical anatomic areas (e.g., eyelid) and for irregular or spotted lesions, laser abrasion [e.g., erbium:YAG or carbon dioxide (CO 2 ) laser] can be a better alternative, as it offers excellent precision over margin and depth control. A histological study, comparing pulsed CO 2 laser abrasion with conventional dermabrasion (standard Hall dermabrader burr) demonstrated that tissue destruction of the dermis was similar and that short-pulsed CO 2 laser abrasion did not cause significant thermal necrosis on the surface of the papillary dermis to interfere with a satisfactory graft take. However, for suction blister grafting, better results were achieved on recipient sites previously prepared with the suction blister technique compared to CO 2 laser abrasion in a single case report. But, the preferred technique for recipient area depends upon the choice of the surgeon. There is ongoing research to simplify the procedure of non-cultured cellular grafting, and modifications with respect to safety of the procedure should further be taken into account [[Figure 1]a-c]. At least in our experience, the use of special culture media can be replaced by phosphate-buffered saline (PBS) or saline solution without xenobiotics (e.g., bovine serum or pituitary extract or other foreign proteins). Bovine serum, as a neutralizing agent for trypsin, can be substituted by soybean-derived trypsin inhibitor or autologous human serum drawn from the patient. To further simplify the laboratory procedure, one could also use the simplified cellular grafting technique described by Goh et al. This modification reduces cell preparation time, amount of reagents needed and costs, and obviates the need of a laboratory for extraction of cells. With this technique, the extraction of epidermal cells from the donor skin is performed by using an inexpensive 6-well plate, a microfilter, and 3 reagents: trypsin, soybean trypsin inhibitor, and PBS. A comparable commercial kit (ReCell kit) is also available for the extraction of epidermal cells without the need of a laboratory. However, this kit is expensive, which limits its use for routine use. One comparison study (n=5) between the commercial kit and the conventional method of cell suspension preparation, suggests that repigmentation was comparable for both the techniques used. However, comparable studies on larger study populations are still missing. The most simplified method would be to replace the enzymatic preparation of a cellular suspension by mechanical separation of epidermal cells. This is reported by Kachhawa, in which he uses epidermal scrapings (till the level of the papillary dermis) to apply directly onto the dermabraded recipient area. However, questions regarding the homogeneity of the repigmentation, possible multiplication factor from donor skin to treatment area and treatment outcome on larger surface areas remain to be investigated. Long-term follow-up studies on non-cultured epidermal cell transplantation suggest that it is effective and safe, particularly for repigmenting stable and localized types of leucoderma. Olsson and Juhlin reported in their follow-up study (1-7 years), results of 52 treated locations. For segmental vitiligo and piebaldism, all patients achieved and retained 95%-100% repigmentation. However, for generalized vitiligo, they achieved only an average repigmentation of 49% in long-term evaluation. Similar results were reported by Mulekar (follow-up period of 1-5 years). They reported good results in segmental and focal vitiligo. Repigmentation was retained until the end of the respective follow-up period. In our long-term follow-up study (1-7.7 years), repigmentation was retained in 93.3% of the grafted areas. Loss of pigmentation was only observed by generalized vitiligo patients and not in segmental vitiligo, piebaldism, and halo nevi and nevus depigmentosus. A review of the available literature was performed to assess the effectiveness and developments in the technical procedure of non-cultured cellular grafting. Non-cultured epidermal cell transplantation provides the possibility to repigment vitiliginous skin manifold larger than the donor skin and can be completed in several hours on an outpatient basis. The selection of patients plays a significant role in achieving a successful repigmentation. Results are excellent in segmental vitiligo, halo nevi, piebaldism, and less in generalized vitiligo. Differences in these selection criteria may explain the variation in treatment outcome. Although this technique offers many advantages compared with the other surgical techniques, it requires highly trained personnel and well-equipped facilities. However, several advances have been made in recent years with respect to simplification of the laboratory procedure and safety. 1. Gauthier Y, Surleve-Bazeille JE. Autologous grafting with non-cultured melanocytes: A simplified method for treatment of depigmented lesions. J Am Acad Dermatol 1992;26:191-4. 2. van Geel N, Ongenae K, De Mil M, Haeghen YV, Vervaet C, Naeyaert JM. Double-blind placebo-controlled study of autologous transplanted epidermal cell suspensions for repigmenting vitiligo. Arch Dermatol 2004;140:1203-8. 3. 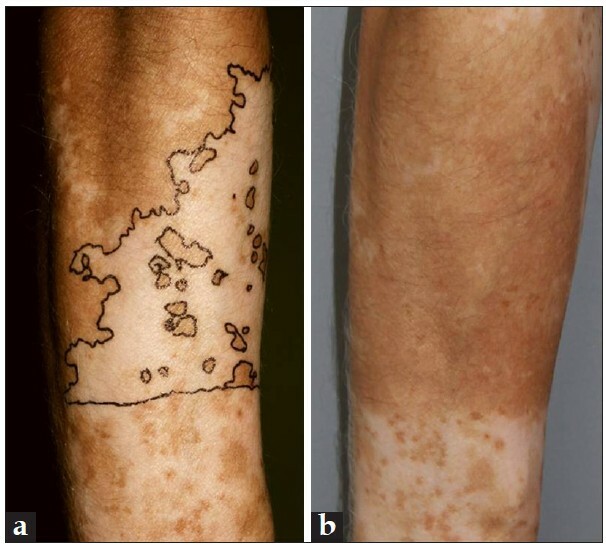 Olsson MJ, Juhlin L. Melanocyte transplantation in vitiligo. Lancet 1992;340:981. 4. Olsson MJ, Juhlin L. Repigmentation of vitiligo by transplantation of cultured autologous melanocytes. Acta Derm Venereol 1993;73:49-51. 5. van Geel N, Wallaeys E, Goh BK, De Mil M, Lambert J. Long term results of non cultured epidermal cellular grafting in vitiligo, halo nevi, piebaldism and nevus depigmentosus. Br J Dermatol 2010 163(6):1186-93. 6. Olsson MJ, Juhlin L. Leucoderma treated by transplantation of a basal cell layer enriched suspension. Br J Dermatol 1998;138:644-8. 7. van Geel N, Ongenae K, De Mil M, Naeyaert JM. Modified technique of autologous non-cultured epidermal cell transplantation for repigmenting vitiligo: A pilot study. Dermatol Surg 2001;27:873-6. 8. Kahn AM, Ostad A, Moy RL. Grafting following short-pulse carbon dioxide laser de-epithelialization. Dermatol Surg 1996;22:965-7. 9. Lee DY, Choi SC, Lee JH. Comparison of suction blister and carbon dioxide laser for recipient site preparation in epidermal grafting of segmental vitiligo. Clin Exp Dermatol 2010;35:328-9. 10. Goh BK, Chua XM, Chong KL, de Mil M, van Geel NA. Simplified cellular grafting for treatment of vitiligo and piebaldism: The "6-well plate" technique. Dermatol Surg 2010;36:203-7. 11. Mulekar SV, Ghwish B, Al Issa A, Al Eisa A. Treatment of vitiligo lesions by ReCell vs. conventional melanocyte-keratinocyte transplantation: A pilot study. Br J Dermatol 2008;158:45-9. 12. Kachhawa D, Kalla G. Keratinocyte-melanocyte graft technique followed by PUVA therapy for stable vitiligo. Indian J Dermatol Venereol Leprol 2008;74:622-4. 13. Mulekar SV, Al Issa A, Al Eisa A. Treatment of vitiligo on difficult-to-treat sites using autologous non-cultured cellular grafting. Dermatol Surg 2009;35:66-71. 14. Back C, Dearman B, Li A, Neild T, Greenwood JE. Non-cultured keratinocyte/melanocyte cosuspension: Effect on reepithelialization and repigmentation--a randomized, placebo-controlled study. J Burn Care Res 2009;30:408-16. 15. Olsson MJ, Juhlin L. Long-term follow-up of leucoderma patients treated with transplants of autologous cultured melanocytes, ultrathin epidermal sheets and basal cell layer suspension. Br J Dermatol 2002;47:893-904. 16. Mulekar SV, Al Eisa A, Delvi MB, Al Issa A, Al Saeed AH. Childhood vitiligo: A long-term study of localized vitiligo treated by non-cultured cellular grafting. Pediatr Dermatol 2010;27:132-6. 17. Mulekar SV. Long-term follow-up study of segmental and focal vitiligo treated by autologous, non-cultured melanocyte-keratinocyte cell transplantation. Arch Dermatol 2004;140:1211-5. 18. Issa CM, Rehder J, Taube MB. Melanocyte transplantation for the treatment of vitiligo: Effects of different surgical techniques. Eur J Dermatol 2003;13:34-9. 19. Mulekar SV. Melanocyte-keratinocyte cell transplantation for stable vitiligo. Int J Dermatol 2003;42:132-6. 20. Mulekar SV. Long-term follow-up study of 142 patients with vitiligo vulgaris treated by autologous, non-cultured melanocyte-keratinocyte cell transplantation. Int J Dermatol 2005;44:841-5. 21. Pandya V, Parmar KS, Shah BJ, Bilimoria FE. A study of autologous melanocyte transfer in treatment of stable vitiligo. Indian J Dermatol Venereol Leprol 2005;71:393-7. 22. Xu AE, Wei XD, Cheng DQ, Zhou HF, Qian GP. Transplantation of autologous non-cultured epidermal cell suspension in treatment of patients with stable vitiligo. Chin Med J (Engl) 2005;118:77-9. 23. 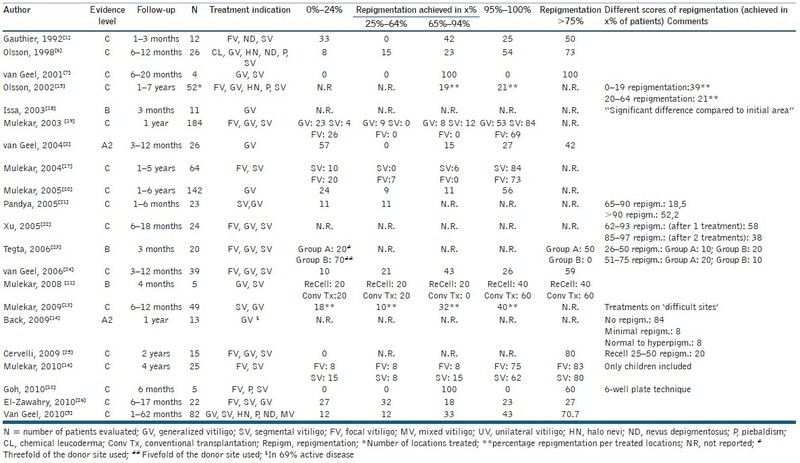 Tegta GR, Parsad D, Majumdar S, Kumar B. Efficacy of autologous transplantation of non-cultured epidermal suspension in two different dilutions in the treatment of vitiligo. Int J Dermatol 2006;45:106-10. 24. van Geel N, Ongenae K, Vander Haeghen Y, Vervaet C, Naeyaert JM. Subjective and objective evaluation of non-cultured epidermal cellular grafting for repigmenting vitiligo. Dermatology 2006;213:23-9. 25. Cervelli V, De Angelis B, Balzani A, Colicchia G, Spallone D, Grimaldi M. Treatment of stable vitiligo by ReCell system. Acta Dermatovenerol Croat 2009;17:273-8. 1 Vitiligo: an evidence-based update. Report of the 13th Evidence Based Update Meeting, 23 May 2013, Loughborough, U.K.